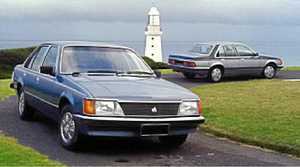 GENERATION GAME: The just launched Commodore VFII lines up beside the model that started it all: the 1978 VB. 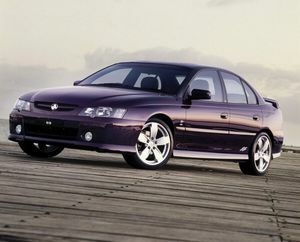 THIS month the final locally produced Holden Commodore - the VFII - goes on sale across Australia. Its arrival brings the curtain down on 37 years of Commodore manufacture on home soil, the Aussie icon set to be replaced by an as yet unconfirmed imported large car wearing the Commodore badge. As well as local manufacturing, this will bring an end to Commodores as we know and love them best: V8s and rear wheel drive will be consigned to the history books. But instead of lamenting the closure of such a significant Australian automotive chapter, let's celebrate the good times of a nameplate that has become a huge part of Australian folklore, and ultimately legend. 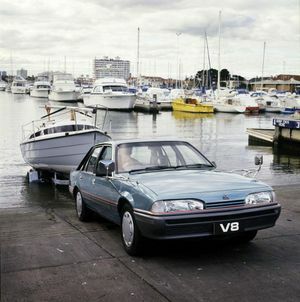 The story began in 1978 when Holden introduced the VB Commodore sedan. 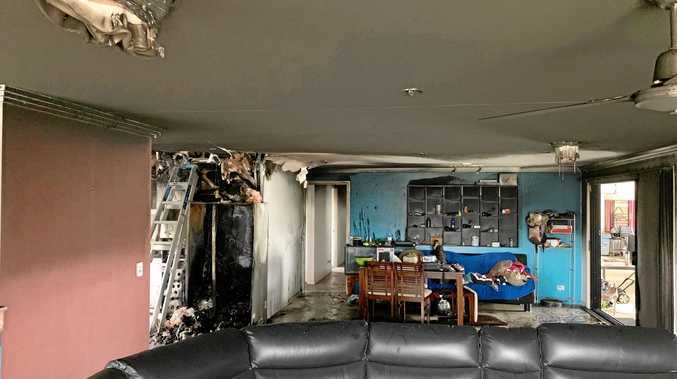 It would ultimately replace the larger and thirstier Holden HZ range, combining German body design - Opel's Rekord E body shell with Senator front end - with an Australian engine and mechanical components. The Commodore was a marked change of direction for Holden. The new sedans and station wagons were shorter and narrower than the full-size family car Kingswood range, as well as more luxurious, more sophisticated and more economical. A reported $110 million had been spent on the car's development, and it soon paid dividends. 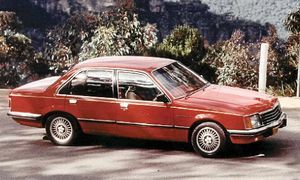 The VB Commodore became Australia's best-selling car in 1979, and scored its first of five Wheels Car of the Year awards. You could buy your original Commodore sedan in base, SL and SL/E variants, with prices starting at $6513 and topping out at $10,513 for the SL/E. Engine choice - all painted red - was between a 2.85-litre, 3.3-litre (both six-cylinders), 4.2-litre or 5.0-litre (the V8s), with power ranging from 64kW up to 114kW. You could opt for a four-speed manual, three-speed Tri-Matic auto, or THM auto for the 5.0-litre V8. And what of your spec back in 1978? Bluetooth, airbags, stability control and all those modern niceties would be light years away, but at launch the Commodore dazzled with its available kit. Base model buyers could tick boxes for 15-inch alloy wheels, air conditioning, corded cloth seating, power steering and headlight washers and wipers. SL models had corded velour trim, inertia reel rear seatbelts, rear centre armrest and twin exterior mirrors as standard, while top line SL/Es scored a burr walnut dash, chrome accents, Blaupunkt stereo radio cassette, electric aerial, tachometer and cut pile carpet. You could even option space age central locking and power windows. 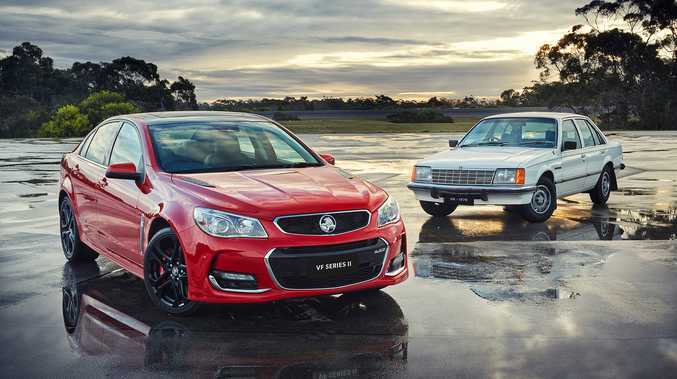 The original VB Commodore set the standard for every generation and iteration that followed, right up to today's 304kW 6.2-litre V8 VFII swansong. You've come a long way, baby. Launched October 1978 as a four-door sedan in base, SL and SL/E variants, with a wagon following in 1979. Sold alongside the Kingswood, Torana and Sunbird sedans initially and became a best seller and award winner. Peter Brock-led works team secure top three places in Repco Round Australia Reliability Trial in six-cylinder VBs. "Egg-crate" style grille and "shadow tone" two-tone paint arrive, revised engine technology improves power and efficiency, revised suspension improves ride. 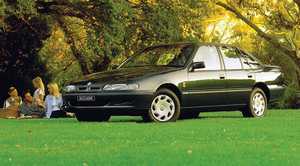 "L" model distinguished the base level Commodore with its 1.9-litre four-cylinder. Australia's best selling car again. Horizontal slat grille, new front and rear lights, rear seat headrests and optional five-speed manual arrive. 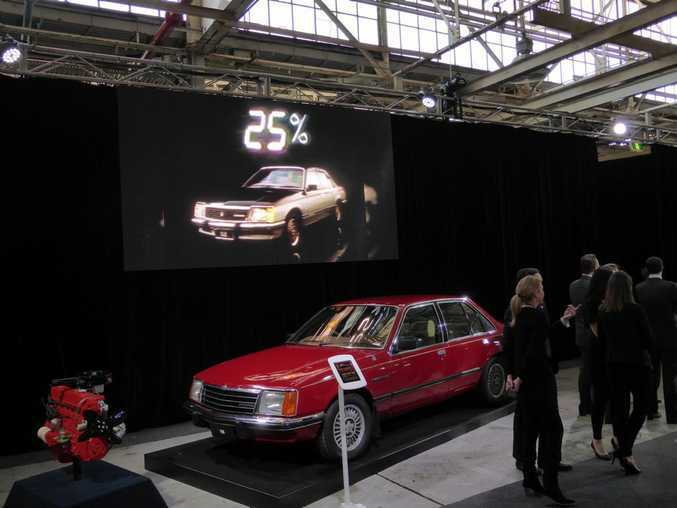 Fuel economy bettered by up to 14%, while the 'SS' model came in 1982, with top-spec 184kW Group Three 5.0-litre V8 produced by Peter Brock's HDT Special Vehicles. Brock and Larry Perkins win Bathurst in a Commodore in 1982 and 1983. Significant styling and mechanical changes with increased technology and standard spec at a lower price. 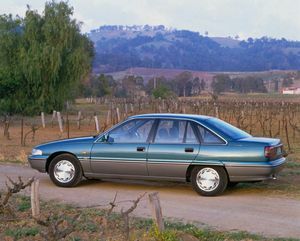 Six-window glasshouse makes car look larger, 3.3-litre black engine has electronic fuel injection as an option, and naming convention now Executive, Berlina and Calais. Calais features digital/analogue electronic instrument panel claiming to be the most advanced in the world. Brock and Perkins win 1984 Bathurst. Major facelift with smoother lines, narrow headlights and sporty integrated rear spoiler, VL outsells the Falcon in the private sector for the first time. Controversially, Nissan 3.0-litre engine and transmission imported for use, giving the base models 33% more power and 15% better economy. A turbocharger was optional upping power from 114kW to 150kW. Homologation special SS Group A race-eligible models produced. 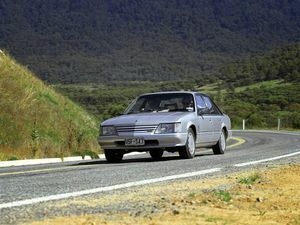 Wheels 1988 Car of the Year and Australia's best seller in 1989, the larger VN was based on the German design of the Opel Senator and Omega, matching the Falcon for size. Holden's own 3.8-litre V6 fitted as standard as powerful as old carburettored V8, while 165kW 5.0-litre V8 and 2.0-litre four-cylinder also available. VN wagon could seat seven or even eight with an extra bench seat. Facelift is minor, but independent rear suspension arrives for Calais and SS models, and is optional for the rest of the sedans. Central locking, power mirrors and anti-theft system were standard. 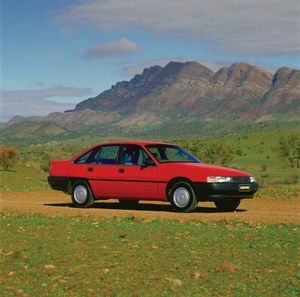 A HSV-enhanced 180kW V8 engine became optional across the range in early 1992, as does ABS. Remains our best selling car. Holden invests $100 million in plant and equipment for the new VR - its exterior 80% changed over the VP, with rounder rear wheel arches and "twin port" grille. Acclaim and Calais models had a driver's airbag as standard. More refined engines (3.8 V6 and 5.0 V8 only options) and suspension, more comfort and convenience and a 2100kg towing capacity. 1993 Bathurst winner and Australia's runaway best seller. Minimal styling changes, but smoother, more powerful and economical ECOTEC 3.8-litre V6, and becomes the first locally built car to introduce dual airbags. Series II sees a new five-speed Getrag manual gearbox, while a 165kW supercharged V6 lands in 1996. A $600 million investment brings a totally new Commodore - the biggest yet - with more sculpted style, bigger and classier cabins and more safety. Australia's first traction control system features, while Calais has dual zone climate. 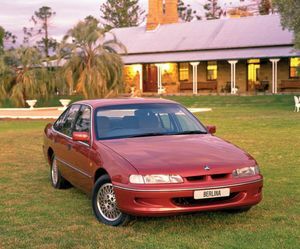 5.7-litre Gen II V8 arrives in VT Series II, while VT wins Bathurst and Wheels Car of the Year for 1997. Bigger twin port grille and teardrop headlamps lead the styling upgrades. 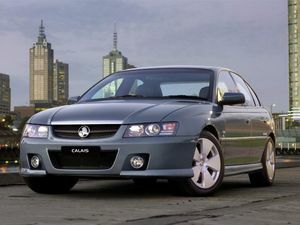 ABS standard across the range - an Australian first for a family car - and Commodore is best seller for the sixth straight year in 2001. More angled lines and more aggressive face improve style and aero, while multi-function digital displays, dashboard and centre console are totally redesigned. Uprated chassis dynamics and steering improve drive, while Rear Park Assist and six-stack in-dash CD player are options. SS wagon introduced in 2003, and Commodore celebrates its 25th anniversary. "Twin spear" sculpted bonnet differentiates the VZ, and has a new 175kW/190kW locally produced Alloytec V6 engine underneath. More improvements to brakes, suspensions and steering, while SS and SV8 models now have 250kW V8s. Acclaim and Calais have electronic stability programs - a first for an Aussie-built car. 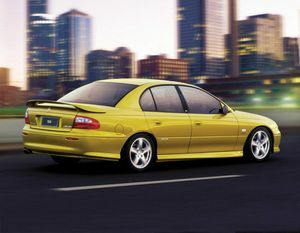 2005 sees a Commodore win Bathurst for the seventh successive year, and is best seller for the tenth year. Australia's first $1 billion car program delivers the VE with striking new exterior and interior design. Crash avoiding ESP made standard, curtain airbags available for the first time, while sat nav and rear seat DVD were optional if not standard. 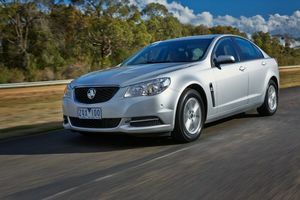 V6 and V8 engines get power and torque boosts and a 270kW 6.0-litre V8 is the most powerful ever on a standard Holden. 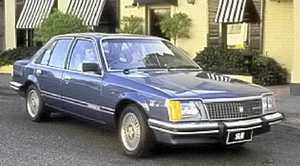 The final Commodore to be manufactured in Australia. More sculpted appearance externally, while inside an eight-inch touchscreen is standard, as is keyless entry and auto-park assist. First Commodore with electric power steering system. VFII arrives in October 2015 as the fastest and most powerful ever, with a 304kW 6.2-litre for all V8 models. Has been named Wheels Car of the Year of five occasions: 1978 (VB), 1988 (VN), 1993 (VR), 1997 (VT) and 2006 (VE). There have been 22 Commodore winners at Bathurst; Ford's Falcon has won 14 times. 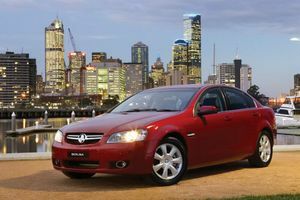 The best-selling Commodore of all was the VE (2006-2013), shifting over 520,000 units, 350,000 of these sold in Australia. 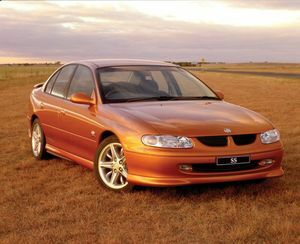 The Commodore's best year for sales was 1998 (VT), when 94,642 sold over the 12 months.